Buffalo Bill’s | Beer Apprentice - Craft Beer News, Reviews, Interviews and Info. Today, I would like to share with you a tasting of an India Pale Ale called Alimony Ale from the Buffalo Bill’s Brewery in Hayward, California. I stumbled upon this little bottle sitting in the corner of the liquor store and thought the label looked cool, so I figured I would give it a try. The bottle had a few words about the brew. 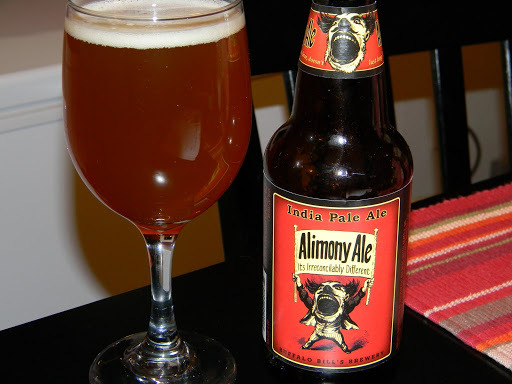 Buffalo Bill’s Alimony Ale was originally brewed for a customer going through a divorce. It has gained a reputation as one of the most eccentric brews, from reports in the Wall Street Journal and Newsweek. No longer one of the bitterest beers in America, just one of the best. If so need be, one can find more information on the brewery and the beers they produce from their website, buffalobillsbrewery.com. I don’t really know what to expect from this beer, so let’s get it poured and see how it measures up. The beer showed a little bit of heft by weighing in a 6.8% ABV. I poured it from a 12 oz. bottle. The appearance showed a decent looking burnt orange, slight peach color. It was hazy with a small off white head. It was not much for size, retention time or for lacing, however some was present to support an average showing. The beer had a nice bit of a fruity smell along the line of a grapefruit citrus, which is typical for most IPA’s, so we are good there. Some toastiness seems to be balanced well in the nose with touches of caramel and even some “woody” notes. As this beer warmed, the caramel really started to come through and push the fruitiness to the background. The taste brought forth some decent smatterings of bitterness at first followed by a bit of sticky pine and a bit of a resinous flavor. The fruity zip was not quite as prominent in the taste as it was in the aroma and it seems to have more of a medium malt characteristic, which turned out to be somewhat toasty. To add to the complexity, I detected a bread and biscuit essence that was very pleasing and suited. The beer presented a medium mouthfeel that did an excellent job of coating the palate. It’s nicely dry, crisp and mostly smooth with a welcome alcohol warmth at the end. The aftertaste lingered for quite some time and it left me wanting for another drink. Nice!!! As I sipped on this beer and let it develop, it really started to come alive. The citrus and fruit moved to the side and the caramel, toasty malt and biscuit tones started to take over and really define this beer. It became almost “candy” sweet in the aroma and started to become more well rounded and balanced in the taste. This brew is a well made, solid beer. It really surprised me and I don’t think I would have any trouble trying this again. If you see it, don’t hesitate to pick it up and let me know what you think.